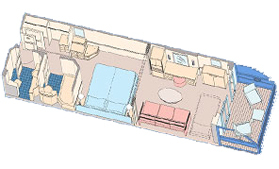 The deluxe family rooms are slightly larger than category 5 staterooms. Space is reduced when the bed is pulled down from the wall, and access to the verandah can then be somewhat restricted. Sleep in comfort on the new Sealy Posturepedic Premium Plush Euro-top mattresses, new pillows and Frette 300 thread-count, 100 percent Egyptian cotton linens. Staterooms feature a split bath, with a shower/bath and sink in one room, and toilet and sink in another, making it easier for families to get ready each morning. All guest rooms are now supplied with H2O Plus Spa bath and shower products, including Sea Marine Revitalizing Shampoo, Marine Collagen Conditioner and Hydrating Body Butter from the H2O Plus premium Spa line. These high-end products, derived from marine botanicals, bring a piece of the ocean into every stateroom. Category 4 staterooms are all on Deck 8, the highest passenger deck, and located either mid-ship or forward.